Day 9 is another Rest day, i need to gather for the next leg of the trip which will bring me to the border with russia. I spend the day getting my dirty Laundry cleaned and walk around Ulaangom, not really a big city that also doesn't have a lot to offer. Nevertheless I manage to buy two scoops of Grease for my front suspension and a Screw to fix my Bike-Bag, where one of them came loose. The Rest of the day I spent relaxing and planning for the next days. On Day 10 it got serious again, today i will leave Ulaangom and travel the northern Route to Tsagannuur the last bigger town before the border to Russia. The Route is over 250km and just the 30km in the beginning are paved. At 9 I left the Hotel, knowing that this will be a two day Trip. 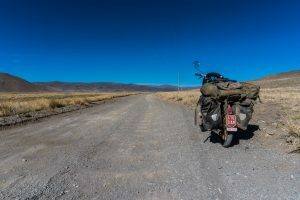 After the first 30km out of Ulaangom I had to leave the nice tarmac road onto a gravel piste to go towards Tsagannuur. The first stretch of road just climbed straight but very slowly towards an opening in the Wall of Mountains ahead of me. Once it flattened out again a bit and got windier I thought this was it, now just along a nice valley to the other side, but oh was I wrong. From a small flat area the Road started winding up through a small valley c onstantly steep, I tried to not misuse my Maxi, since this is about touring and not a race, so I just drove her to the next flatspot waited 10mins for her to cool again and redid that. After an hour however this was just not even possible anymore, so I once again had to walk next to her while she pushed herself. 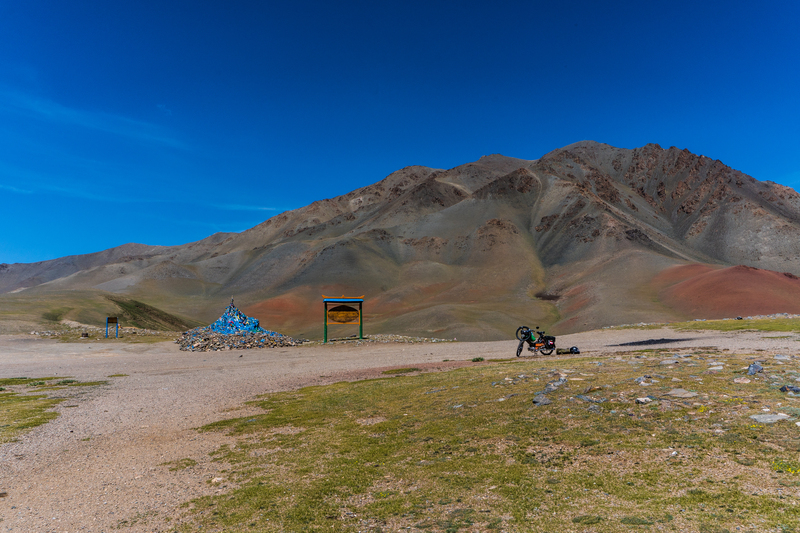 Puch Maxi Travel really involves a lot of walking, but eventually I made it to the top at 2300m (climbing all the way from 900m). On top the Moped really started to make some bad noise, so I let her cool down and "checked" the compression using the flywheel, although she had lost quite a bit of compression it wasn't too bad. The view from up there however really excused for the exhausting ascent, I could see over a big valley with snowcapped mountains in the background and no Ger or House in Sight, just a few winding dirt tracks. But I could also see the next Mountain Pass. On the way down I passed some sheep herders who asked for some water, which I helped them out with, they then inspected my bike and showed me around their motorcycle before driving off again. And as suspected the next mountain Pass was just as steep as the last, just not as much altitude to climb. Being close to my breaking point I asked a passing Truck, that turned out to be from the mongolian Border Patrol if the could maybe throw the bike in the back and drive me up the pass or even farther as I just wasn't having it anymore. Unfortunately the back was full with Recruits and no space for the Moped, two of them however did help me push up the bike the last steepest part of the pass, after they saw me struggling from the top, really thankful to those guys, probably would have taken anouther hour without their help. Driving through a mountain region seemingly devoid of any human life i reached Uureg Lake which was another stunning scenery, at the lake, which is almost at the border to Russia I drove past the Military guys again, this kinda chase went on for quite a bit of the day, they surveying the Land while I ride past, just to get overtaken again by them. But lets not forget this is still all on dirt tracks, which means a lot of washboard, Sand and big Gravel, which made riding not as enjoyable as the scenery did. To reach my intended camping spot for the night one more Pass had to be climbed, this one again proved too steep, but as it was quite a wide end to a valley I just used all the area to drive serpentines through the meadows, which actually worked a lot better than I thought in the beginning, this pass was also the last time I saw the Border Patrol guys. 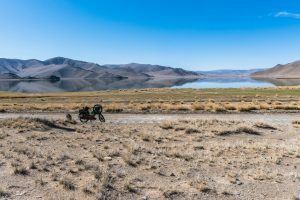 After another stunning ride through the high mountains I reached the Bassin of Achit Nuur Lake and this proved to be the most hostile and uninviting Landscape I rode through on my trip, and I am writing this from Kazachstan still confident of that claim. While driving down into the Basin the Gravel/Sand Track was one "perfect" washboard piste, which only left my to either ride completely offroad on unknown Ground or going at walking speed. Tried both, nothing ideal. In the bottom of the basin the real hardship just started, imagine a dried Riverbed with fist sized Round Rocks going up to Football size and stretch that for 30km. The washboard now suddenly wasn't my biggest problem anymore, the rough surface just through me all over and I even managed to hit some with my exhaust, thankfully nothing got damaged. This Area really looked alien to me, this is how Mars could look like. In this basin would be the biggest watercrossing I will have to do on all this trip, and I had no Idea what awaits me since the water level changes a lot based on season and precipitation. At one point I reached a dry Riverbed and thought "hey that watercrossing wasn't too bad, don't know what everyone was complaining about", I will regret that thought in an hour. Because thats when I reached the real river, slowly the vegetation started getting thicker and the Track started splitting up into different directions, after crossing a small stream I landed in some guys backyard and they really looked at me like I was an alien, but they showed me the direction to where you cross the River. At this time it was already starting to get late and I was thinking about just camping on this side and crossing tomorrow, because the river I reached seemed uncrossable on my Maxi. Some Locals gathered and rode their china bikes through the stream to show me the way, but after they realised the Moped wouldn'to do that they suggested to pick it up and just walk it over to the other side, and as soon as I had my bags off two of them were already off wading through the more than knee-deep river, me struggling to get off my boots and follow along with my bags. We then chatted a bit on the other side, I expressed my gratitude, they showed me the way out of this Green Strip along the River and they were off. I still had to cross a couple small streams and at one actually managed to get the motor to cut out and not restart. That was when I decided to find a campsite. 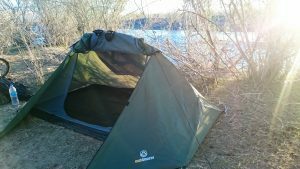 100m off the Track I found one that was ok and set up my camp for the night. This day really was a physical and Mental Challenge for me and my Moped. Day 11 greets me at 5 in the morning, this time i was warm enough during the night. After breaking down my tent and a small breakfast I tended to my Bike, after a few failed attempts to start her a new Sparkplug seemed to to the trick. Just around 70km to Tsagannuur, I'm almost through Mongolia! Ofcourse I managed to get lost once again in this Green labyrinth, but another Local was so nice to guide me the 5kms out of this Garden Eden, back to the lifeless Moonlandscape. Another Mountain Range had to be conquered to reach the border, expecting the worst the road turned out to be slowly climbing through an amazing valley, just the bad road conditions lessened the experience, but they were nothing compared to yesterday. I heard a lot of bad things from other travellers about tsagannur, that people invite you to sleep there and steal your money in the night, so I just fueled up there and took on the next 30km to the border. 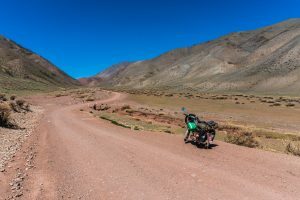 The first bit of road was amazing, finally on tarmac again, but the last 20km it turned into the hardest washboard I had on all the trip, often no way around it my hands felt like I had Nails sticking out of my handlebars. A proper demanding End to Mongolia. In the small village at the border I changed the rest of my Tugrik to Rubels and headed to the gate, it was 11am now. I could enter the Checkpoint very quickly, no queue at the gate, but this would not be a fast border crossing. At customs trying to export my bike something seemed odd, I had to wait quite a bit until someone finally told me what's up. While my Carnet ATA had all the proper importation stamps from Ulaanbaatar Customs, they didn't enter it into the Computer System, so the Border Guys were properly confused. One seemingly pretty senior officer there took on my case and told me he will call UB Customs, but right now those guys have lunch brake and at 12 they will have lunch brake here (there is a timezone change from UB to here). This meant waiting, after a total of 3 hours they finally had sent a copy of my carnet to UB Customs where they entered my Carnet into the System, which meant that the Border could finally stamp me out, what a relief! Leaving the Border building I met the first western bike travelers, I've seen on this trip, just entering mongolia. Another few kilometers on gravel to the russian border later a barbed wire gate directly at the border with a russian guard welcomed me, after checking my Passport he gave my details through via radio and sent me to the Checkpoint, another 20km of Nomansland away, this time with paved roads though. At the russian Checkpoint everything went kinda smooth until my temporary importation, the russian officials couldn't really figure out how to treat my vehicle so it took a while, but everyone was very nice to me, might hav e had to do with my silly mode of transportation. After all I got into Russia though, just took 6hours at the border in total. Leaving the Checkpint though, shock, the Maxi wouldn't start again, only after a lot of pedaling she ached for a kilometer until cutting out again. This was my cue to go to the nearest hotel where I checked in for the night. I was really glad that I changed my Tugriks since I instantly used my Rubels to buy a Sim-card here. In the evening I had another mechanic session at the bike and replacing the ignition fixed the problem. After a talk with the guys from Puch Stöckl back in Austria, there might still be some leftover moisture in the parts messing with it. I really have to thank www.rbo.at at this Point as without them I wouldn't have this Spare Part with me! After 114km today I am finally in Russia, I traversed Mongolia in 10 Days riding over 1600km, what a feat. Mongolia proved to be a tough but beautiful country, that pushed both me and my Maxi to the limits and maybe a bit over them as the next Episode will explain. However for all the Hardships you were always rewarded with stunning Landscapes and great experiences. I'm just glad the offroad riding is now over and Maxi-Touring is now on asphalt roads back home to Austria. But first Russian Altai here we come. An Tag 9 ist wieder einmal Pausieren angesagt, ich muss Kräfte sammeln für den nächsten Teil der Reise, der mich an die Grenze zu Russland bringen wird. Den Tag hab ich damit verbracht meine Wäsche waschen zu lassen und mir Ulaangom etwas genauer anzusehen, leider keine große Stadt in der es auch nicht viel zu sehen gibt. Trotzdem konnte ich zwei Esslöffel Fett für meine Frontfederung kaufen und eine Schraube um eine verlorene meiner Seitentasche zu ersetzen. Den Rest des Tages hab ich entspannt und ein bisschen vorausgeplant. Tag 10, heute wird’s wieder ernst, ich werde Ulaangom verlassen und die nördliche Route nach Tsagannuur, der letzte größere Ort vor der Grenze, nehmen. Mehr als 250km Strecke erwarten mich von denen nur ca 30km am Anfang asphaltiert sind. Um 9 Uhr gings los, nach den ersten 30km musste ich die angenehme Teerstraße verlassen und auf eine Schotterpiste abfahren, die mich kerzengerade bei leichter Steigung zu einer kleinen Öffnung in der Wand aus Bergen vor mir führte. Nachdem ich eine kurze flachere Passage erreichte, dachte ich „Jetzt hast dus geschafft, jetzt geht’s flach durch ein schönes Tal.“, aber falsch gedacht. Von der Flachstelle schlängelte sich die Straße konstant, ordentlich ansteigend durch ein schmales Tal. Um die Maxi nicht überanzustrengen, immerhin geht’s hier um touring und nicht ums rennen fahren, hab ich mich von Flachstück zu Flachstück gerettet und immer 10min pause gemacht um sie etwas abkühlen zu lassen. Nach einer Stunde war aber auch das nicht mehr möglich, also musste ich mal wieder nebenher gehen. Puch Maxi Reisen beinhalten wirklich einiges an wandern. Nach einer gefühlten Ewigkeit hab ich es dann aber auf die Passhöhe auf 2300m geschafft, gestartet war ich bei ca 900m. Die letzten Meter hat sich das Moped dann richtig besorgniserregend angehört, also hab ich sie oben ordentlich abkühlen lassen und Zündkerze sowie am Polrad die Kompression überprüft. Sie hatte doch einiges an Kompression verloren aber es war noch ok.
Der Ausblick von hier oben hat wirklich ein bisschen für die ganzen Strapazen entlohnt. Mein Blick erstreckte sich über ein tolles Hochplateau mit Schneebedeckten Bergen im Hintergrund, kein Ger, kein Haus in Sicht nur ein paar Feldwege, die sich durch die Landschaft schlängeln. Den nächsten Pass konnte ich aber auch schon in der Ferne sehen, was mir nicht unbedingt ein gutes Gefühl gab. Am Weg nach unten kam ich an zwei Viehhütern vorbei, denen ich mit etwas Wasser aushelfen konnte. Anschließend haben sie mich ordentlich ausgefragt, alles mit Händen und Füßen natürlich, mein Moped inspiziert und mir Ihres gezeigt, bevor sie auch schon in die Ferne davonfuhren. Wie vermutet war auch der nächste Pass zu steil für die Maxi, wenn auch weniger Höhenmeter zu bewältigen waren. Am Rande meiner Leidensfähigkeit hab ich dann einen vorbeifahrenden LKW, der zum Mongolischen Grenzschutz gehörte, ran gewunken ob ich die Maxi hinten drauf packen könnte und sie uns auf den Pass oder vielleicht sogar noch weiter bringen könnten. Leider war die Ladefläche schon voll mit Rekruten und es gab keinen Platz für die Maxi, zwei von denen halfen mir aber später die Maxi das letzte steile Stück hochzuschieben, nachdem sie mich von oben schieben gesehen hatten. Ich war echt dankbar für die Hilfe, ohne hätte es wohl noch eine Stunde gebraucht, bis ich oben angekommen wäre. Weiter gings durch eine menschenleere Berglandschaft, welche mich zum Uureg See, mit einer weiteren atemberaubenden Aussicht brachte. Am See, der fast an der Grenze zu Russland liegt, bin ich an den Grenzschützern vorbei gefahren, wir haben uns dann die nächsten Kilometer immer wieder getroffen, wenn sie gerade die Gegend beobachtet haben fuhr ich vorbei, nur um ein paar Minuten später wieder von Ihnen überholt zu werden, und immer haben wir uns freundlich zugewunken. Aber die Straßenbeschaffenheit wollen wir trotz allem nicht vergessen, all dies findet auf Erdpisten statt, also haufenweise Wellblechpisten, Sand und große Steine, was die Fahrt nicht annähernd so ansprechend wie die Landschaft machte. Um meinen angepeilten Übernachtungsspot zu erreichen musste ich noch einen Pass überwinden, der sich auch als zu steil herausstellte, nachdem dieser aber am ende eines etwas breiteren Tales war konnte ich aber die Wiesen über die ganze breite nutzen um mich langsam in Serpentinen hochzuarbeiten. Und es ging sogar deutlich besser als ich gedacht hatte, an dem Pass sah ich dann auch die Grenzschützer zum letzten Mal. Nach einer weiteren Fahrt durch eine geniale Hochgebirgslandschaft begann dann der Abstieg in das Becken des Achit Nuur Sees. Diese Landschaft hat sich wirklich als die lebensfeindlichste Gegend des Trips herausgestellt und ich schreibe diesen Bericht in Kasachstan, wo ich noch immer zu dieser Aussage stehe. Die Schotter/Sandstraße ins Becken runter war ein Bilderbuchbeispiel für Wellblechpisten, dort blieb mir nur komplettes Offroadfahren auf unbekanntem Untergrund übrig oder Schrittgeschwindigkeit übers Wellblech, beides probiert, nichts wirklich ideal. Am Boden des Beckens wurde es dann aber richtig heftig, man stelle sich ein ausgetrocknetes Flussbett mit losen Faust- bis Fußballgroßen runden Steinen vor und das ganze auf einer Distanz von 30km. Das Wellblech war plötzlich nicht mehr meine größte Sorge, die unebene Piste hat mich nur so hin und hergeworfen und ich hab mir auch den Krümmer ein paar Mal angeschlagen, Gottseidank ohne Schaden zu hinterlassen. Diese Landschaft mutete wirklich außerirdisch an, als ob man am Mars oder Mond unterwegs ist. In diesem Becken stand auch die größte Flussdurchquerung der Reise an und ich hatte keine Ahnung was mich erwartete, da der Wasserstand abhängig von der Jahreszeit und dem Wetter stark fluktuiert. Ich passierte ein ausgetrocknetes Flussbett am Weg und dachte schon „oh das wars? Das war ja gar nicht so schlimm wie alle sagen“, diese Aussage sollte ich aber noch bereuen. Denn dann erreichte ich den richtigen Fluss, langsam wurde die Vegetation grüner und dichter und der Weg teilte sich in unterschiedliche Richtungen auf, mehrere Kilometer im Süden von hier liegt die Stadt Nogonnuur. Nachdem ich einen kleinen Seitenlauf durchquert hatte landete ich im Garten einer einheimischen Familie, die mich wie einen Außerirdischen ansahen, aber sie zeigten mir den Weg zur Furt. Als ich den Fluss erreichte war es doch schon etwas spät und ich wollte schon auf dieser Seite campen und versuchen morgen irgendwie überzusetzen, denn der Fluss war definitiv nicht mit der Maxi zu durchqueren. Wie so oft haben sich dann auch einige Einheimische eingefunden und haben mir den Weg durchs Wasser mit Ihren Motorrädern gezeigt, nachdem ich ihnen aber erklären konnte, dass die Maxi da nicht durchkommt, schlugen sie vor sie rüber zutragen. Ich konnte gerade meine Taschen abnehmen da hatten sie zwei typen schon aufgehoben und wateten durch den mehr als knietiefen Fluss. Etwas gestresst zog ich meine Stiefel aus und watete ihnen mit meinen Taschen hinterher. Auf der anderen Seite haben wir noch etwas „geredet“ und ich habe ihnen meine Dankbarkeit klar gemacht, nachdem sie mir noch den Weg aus diesem Grüngürtel gedeutet hatten waren sie auch schon weg. Ein paar kleinere Bäche mussten aber noch durchquert werden und bei einem ging mir der Motor auch noch aus und die Maxi wollte nicht mehr starten. An diesem Punkt habe ich beschlossen einen Zeltplatz in der Nähe, am Fluss zu suchen. Dieser Tag war wirklich eine Physische und Psychische Herausforderungen für mich und mein Moped. Tag 11 begrüßt mich um 5 in der Früh, diesmal war mir wenigstens nicht zu kalt in der Nacht. 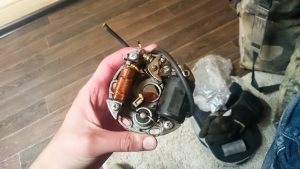 Nach dem Abbau meines Zeltes und einem kleinen Frühstück habe ich mich dem Moped gewidmet, nach ein paar fruchtlosen Versuchen sie zum laufen zu bringen, brachte ein Zündkerzenwechsel den erhofften Erfolg. 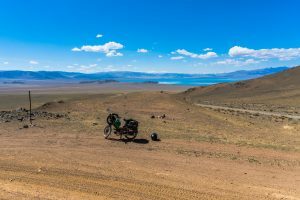 Noch 70km bis Tsagannuur, die Mongolei ist fast durchquert! Natürlich hab ich mich nochmal in diesem Grünen Labyrinth verfahren aber ein weiterer Einheimischer war so nett mir die 5km bis zum Start der Mondlandschaft voraus zu fahren. Noch trennt mich eine weitere Bergkette von der Grenze, ich erwartete bereits wieder ähnliche Strapazen wie am Vortag aber diesmal war mir die Mongolei gnädig. Eine langsam ansteigende Straße führte durch ein wunderschönes schmales Tal, lediglich die Straßenbeschaffenheit war wieder einmal alles andere als wünschenswert, aber bei weitem nicht so schlimm wie gestern. Von anderen Reisenden wurde mir geraten in Tsagannuur vorsichtig zu sein, da hier oft Leute eingeladen und dann bestohlen werden, daher habe ich hier nur aufgetankt und bin weitergefahren. Das erste Stück Straße ca 10km war asphaltiert und mal wieder richtig genial zu fahren, danach kamen aber 20km härtester Waschbrettpiste, meine Hände fühlten sich an als würde ich mit Nägeln gespickte Griffe umklammern. 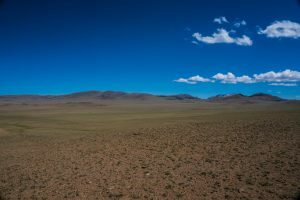 Ein wirklich passender Abschluss für die Mongolei. Im kleinen Dorf am Grenzübergang konnte ich den Rest meiner Tugrik in Rubel wechseln und kam am Tor an, es war 11 Uhr Früh. In den Checkpoint an der Grenze kam ich schnell, nachdem es keine Schlange davor gab, aber der Grenzübertritt würde keine schnelle Sache werden. Am Zoll, wo ich mein Moped ausführen wollte, musste ich ungewöhnlich lange warten, bis mir jemand erklärte, was los war. Obwohl mein Carnet ATA korrekt vom Zoll in Ulaanbaatar ausgefüllt und abgestempelt wurde, hatten die mein Carnet nicht ins Computersystem eingetragen, was in kompletter Verwirrung bei den Grenzbeamten resultierte. Ein scheinbar ziemlich hoher Beamter dort nahm sich dann meines Falles an und erklärte mir er werde in UB anrufen, nur sind die gerade auf Mittagspause und um 12 gehen sie hier in Mittagspause (zwischen UB und der Grenze hier ist 1h Zeitverschiebung). Das hieß warten, nach insgesamt 3 Stunden wurde eine Kopie des Carnets nach Ulanbator geschickt und dort rückwirkend eingetragen, was bedeutete mir konnte endlich der Ausfuhrstempel ins Carnet gedrückt werden, was für eine Erleichterung! Beim verlassen des Checkpoints hab ich die ersten zwei Motorradreisenden meiner Tour getroffen, die gerade in die Mongolei einreisten. Nach ein paar weiteren Kilometern auf Schotter begrüßte mich ein Stacheldrahttor mit russischem Soldaten exakt an der Grenze. Nachdem er meinen Pass gecheckt hatte, gab er meine Info via Funk an den Checkpoint durch und ich konnte die 20km Niemandsland bis dorthin fahren, diesmal auf asphaltierter Straße. Am Russischen Grenzübergang ging auch alles ziemlich unproblematisch bis es um den temporären Import meines Mopeds ging, die Beamten wurden nicht wirklich schlau aus der Maxi und wussten nicht wie sie sie registrieren sollen, daher dauerte es eine ordentliche Weile. Aber alle waren sehr freundliche zu mir, hing vielleicht auch mit meinem komischen Gefährt zusammen. Aber nach alledem kam ich schließlich nach Russland, dauerte nur insgesamt 6 Stunden. Beim verlassen des Checkpoints dann der Schock, die Maxi will nicht starten! Nur nach langem treten konnte ich ihr einmal ein paar hundert Meter Fahrt entlocken, bis sie wieder ausging. Daher gings erstmal direkt ins erste Hotel für die Nacht. Dort war ich froh Rubel dabei zu haben, da ich mir auch gleich eine Russische SIM kaufen konnte. Am Abend gabs dann noch eine Reparatur-aktion, das tauschen der Zündplatte hauchte der Maxi wieder leben ein. 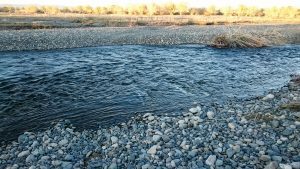 Nach einem Austausch mit dem Team von Puch Stöckl daheim in Österreich, könnte es an Feuchtigkeit gelegen haben, die noch vom Fluss in den Komponenten war. An diesem Punkt muss ich mich auch bei www.rbo.at bedanken, denn ohne deren Unterstützung hätte ich das nötige Ersatzteil erst gar nicht dabei gehabt. Nach 114km hab ich es heute endlich nach Russland geschafft. 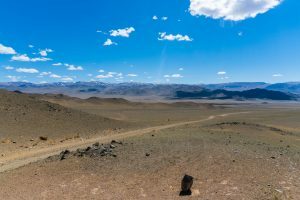 Ich habe die Mongolei in 11 Tagen auf 1600km durchquert, was für eine Leistung. Die Mongolei hat sich als ein hartes aber wunderschönes Land herausgestellt, welches mich und mein Moped ans Limit gebracht hat, eher auch etwas über das Limit, aber dazu gibt’s in der nächsten Episode mehr. Jede Herausforderung in der Mongolei wurde immer mit tollen Ausblicken und genialen Erlebnissen belohnt. Ich bin nur froh, dass die Offroad-fahrerei nun ein Ende hat und Maxi-Touring nun auf Asphalt zurück nach Österreich fahren kann. Aber erst geht’s nun durch das Russische Altai-Gebirge. Ein unglaublich spannendes Abenteuer, das ich von Anfang an mitverfolge! Die schwierigsten Passagen dürften jetzt wohl geschafft sein, sodass das Puch-Maxi auch die “restliche Strecke” durchhalten wird.